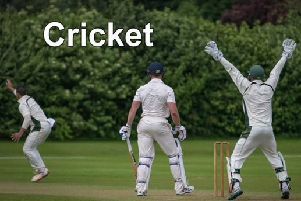 Horncastle CC sit third in the Lincolnshire County League Fourth Division following 65-run win over Old Lincolnians Seconds. Liam Wilkinson struck 70 runs to help guide the hosts to a score of 166, before the team were dismissed in the 39th over on Saturday. Jonathan Clark (14), Christopher Bargh (14) and Ben Wilkinson (12) offered support with the bat as the hosts gave Lincolnians something to chase. In response, Horncastle needed less than 26 overs to dismiss 10-man Lincolnians. Nathan Whiting claimed five victims for the loss of 25 runs while other scalps were taken by Ben Wilkinson (3-35) and Liam Wilkinson (1-20). Horncastle’s Sunday Firsts suffered a five-run defeat at home to Scothern in the Lincoln and District League Division Two this weekend. The 10-man away side posted 170 before being dismissed with four balls left. But Horncastle finished their 40 overs just five runs shy of their opponents. With the ball, Jack Tate (3-34), Richard Hickling (2-29) and Gareth Jones (2-40) did the damage, while Nathan Whiting added a run out. Good knocks by Lewis Lovegrove (37), Rob Bee (35), Jones (29), Whiting (19) and Chris Guest (13) gave Horncastle hope right until the death. Horncastle’s senior sides are both without contests this weekend.